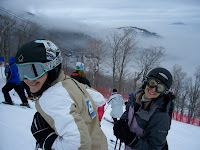 The Adirondacks play host to a plethora of athletic events and competitions. Essential to our economy, these events simply would not happen without the assistance of enthusiastic and loyal volunteer workers. For example, last week's FIS Nor Am Alpine competition relied heavily on volunteer stewards, gatekeepers, course slippers and timers, to name a few. Pictured are two of our helpful and happy volunteer course slippers. I am certain the Olympic Regional Development Authority (ORDA) and the New York Ski Education Foundation (NYSEF) were most grateful for all the wonderful assistance they received over the course of this long, cold winter. Although each volunteer receives a ski pass for one day's skiing at Whiteface, Gore or Mount Van Hoevenberg for their effort, most of us show up at 7:00 a.m. on race days simply because we believe in the power of sport and the importance of supporting our community.